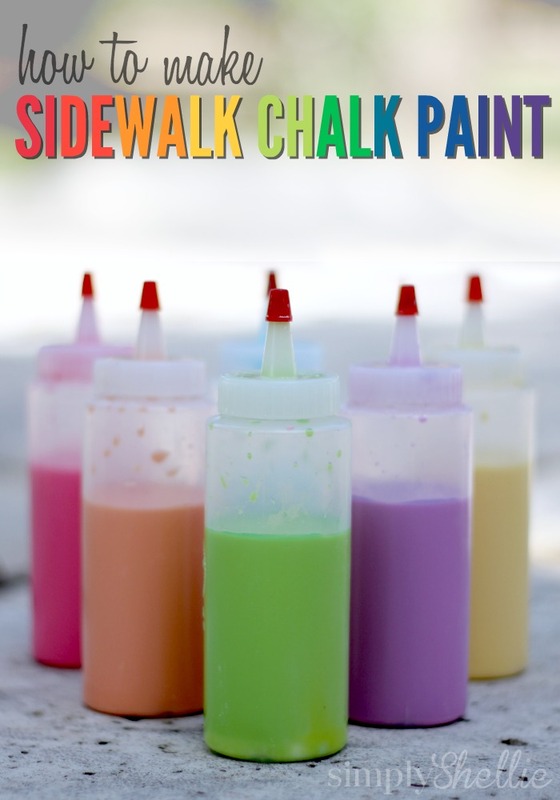 One of my favorite kids summer activities is making sidewalk chalk paint. 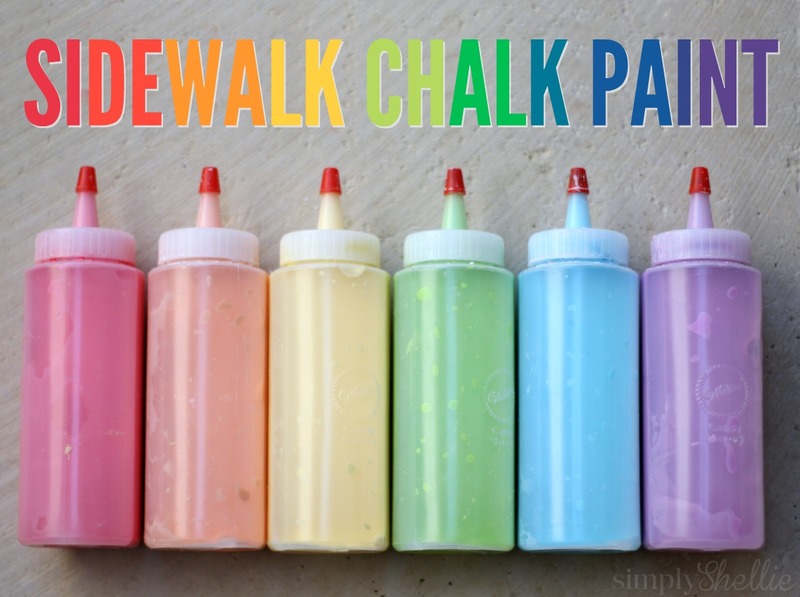 It’s such a fun alternative to traditional chalk. Plus it’s super easy and inexpensive to whip up. You just need three ingredients which you probably already have: cornstarch, water and food coloring. I prefer to use squeeze bottles but you can use any kind of container you’d like. I usually grab mine off Amazon or from Michael’s in the baking aisle. 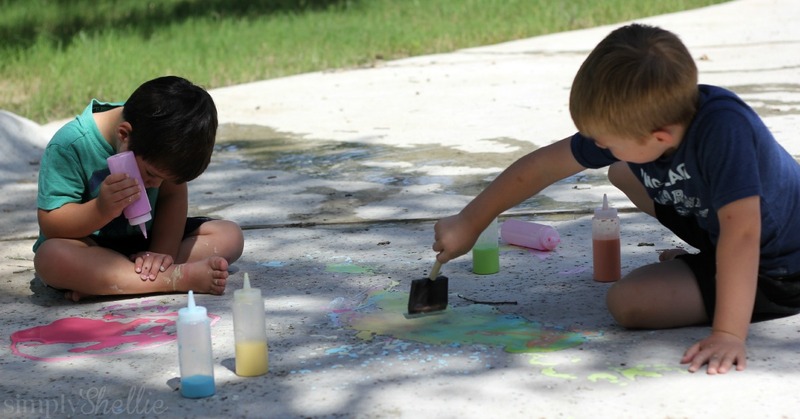 Once you have all your paints mixed, take them outside and play! you can just squirt on the ground and make cool designs or break out the paintbrushes and paint traditionally. If the cornstarch starts to settle, just shake it up again. If you prefer to use containers, muffin tins work great. 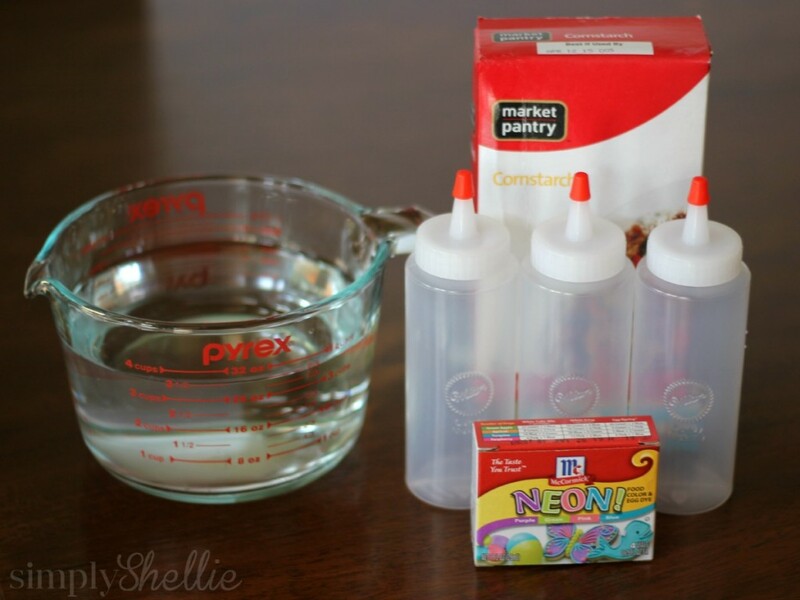 You can just squirt the paint into the cups and refill when they run low…or get knocked over. My boys always knock over the containers which is why we opt for the squeeze bottles! Doesn’t most food coloring stain? How easy is it to wash off of the sidewalk, and the kiddos, and clothes? I just use regular store brand food coloring and I’ve never experienced it staining my kids or the driveway. It just washes right off. It could be because it’s so heavily diluted in the cornstarch/water mixture and not concentrated. However if you are concerned about it you could use fewer drop or just paint with it white. It would still be super fun! For those that are afraid of food coloring staining you could use washable liquid watercolor instead 🙂 Thanks for sharing your recipe! This looks like it will be so much fun for my little ones! I am totally trying this out this weekend! Thanks so much for the recipe, I will let you know what my little ones think! Saw your link over at Create Link Inspire and I am so happy that I clicked your link! Pinned it! Thanks Gina! You are so sweet. My guys now 3 & 4 have been playing with this since they could walk. I’m sure yours will love it! Thank you for this recipe. My grandkids will love this activity. Pinned! I’ve used tye dye dyes in it, it doesn’t stain. I wouldn’t let them spray it on my retaining walls, but the driveway and grass are fine. We do it in the snow too. I was wondering could you use this paint on paper? The kids I work with at school love painting i find different ways they can paint. I bet you could! But keep in mind that it’s like chalk and can brush off easily. So you might want to do a test run at home and see how it works on your paper before attempting it on a larger scale. It dries up quickly. I’d use within 48 hours.